As dashiki is to most West African countries so is Toghu to Cameroon precisely to the North-west Region of Cameroon. Over the last few years, this cultural elegance has gradually stepped into the limelight in the fashion industry, as it graces the streets, runways and red carpets in Africa, Europe and the USA. 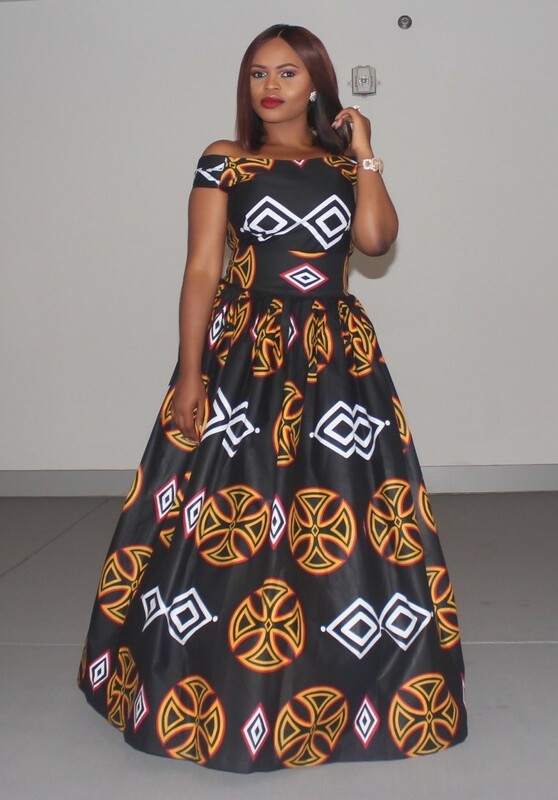 It’s brightly coloured embroidery and deeply entrenched traditional designs have caught the attention of renowned celebrities like Lupita Nyong’o, Gayle King, Alex Ekubo, Ikechukwu Mitchel Ogbonna just to name a few. Amongst the growing number of Toghu admirers and promoters, is a young and dynamic woman who operates a culturally driven initiative known as IWEARTOGHU. IAM had the chance to talk with her and she had a lot to share with everyone. IAM: Who is the brain behind Iweartoghu? The brain behind Iweartoghu is no other than an ordinary young lady who loves and embraces her culture and have always wanted to create a platform to share the beauty of this rich culture with the world. A task I perform through social media, fashion events, organization and community involvement. My name is Mirabel Toh and I was born in Douala Cameroon, raised in Atlanta, Georgia and I currently live in Dallas, Texas but I represent Bamenda (capital of the Northwest Region in Cameroon) to the core, as I am a Babanki girl. I consider myself a pretty active social media person. I use Instagram, Facebook, Snapchat, YouTube and WhatsApp on a regular basis. This explains why it was most convenient for me to start this initiative on Instagram. I do this with the help of friends, family, designers and loyal followers who send and tag me on pictures daily. As of now it has a total of 866 followers. IAM: What exactly is Iweartoghu? Iweartoghu is a young social media initiative aimed at promoting our culture through fashion and to encourage people to wear it with pride. In my opinion, Toghu is the most significant cultural identity of the people from the Northwest region of Cameroon. Toghu is a colourful and finely embroidered outfit traditionally worn by royalties and notable individuals. But today, Toghu is worn by everyone typically during weddings, festivals and other cultural events. Iweartoghu was equally inspired by my love for fashion, culture and technology. Today we live in a society where social media drives and influences every aspect of our lives (politics, fashion, religion, social life etc). As a result, a lot of people and/or organizations have taken advantage of that to rebrand, market and promote their products or beliefs. Through social media, we have seen that the African entertainment industry as well as the fashion industry have become a force to be reckoned with. Dominant African cultures have used social media as a platform to promote their culture through music/dance, fashion, movies/stand-up comedy, blogging, weddings etc. Coming from a country with roughly 25 million people, we can’t compare with other countries in numbers but there is a lot we can learn from them and use that to promote ourselves as well. I have been highly motivated by social media pages like bellanaijaweddings, idoghana, southafrica, traveltosa, zimweddings, Ethiopia, irepcamer, glowmonat etc. These social media pages promote and highlight one or more aspects of their culture for the world to see. I believe Cameroon is lacking significant representation when it comes to this. Instead of watching other cultures display and celebrate themselves, I think we all need to take the initiative and do the same for ourselves. Therefore, I created the page @iweartoghu in January 2018 to celebrate the rich culture of my people. IAM: Toghu is still making its debut in the African fabric and fashion industry, and until now only a few people know about it. How do people from other cultures respond to the fabric/culture you are representing? I’ve been blessed to have friends from different cultural backgrounds and I have had the opportunity to share in their rich culture so when it came to this, my culture, I had no doubt they were going to be supportive. I have friends from different cultural backgrounds who religiously like every single picture I post every day. Some of my followers are Nigerians who live, work and study in Cameroon, so they easily identify with the culture. IAM: Do you think Toghu is the next big thing in the African fabric and fashion industry? Toghu is on the rise without a doubt. I see more and more people wearing it frequently. I believe Cameroon has a lot to offer when it comes to educating the world about the beauty of its diverse culture through fashion. Our athletes did so proudly, by wearing Toghu at the opening ceremony of the 2016 summer Olympics in Rio de Janeiro. IAM: What can be done to create more awareness and acceptance? There are fashion designers who are playing their part to take Toghu to the next level. Just to name a few we have Kibonen Nfi (Kibonen.ny), Syl Anim (Sylanimdesigns), Amah Bertrand (@amahfashionhouse), ShaShaDesigns and much more. I tag most of the designers in the pictures I post if I know it’s their work. Designers and celebrities play an important role in promoting our culture through their work. However, it breaks my heart to see Cameroonian designers go against each other. If we continue at this rate, we are going to destroy a brand that hasn’t even made it to the top yet. Moreover, I believe regular Cameroonians play the most important role. A lot of people say Cameroon lacks proper representation on social media but then, they sit back and wait for someone else to try to represent the country just for them to later on criticize his or her efforts. If you believe something lacks representation or is being misrepresented, then take the initiative to do it right. For anything to be great and successful, it needs a lot of internal and external support. There’s no one more fit to represent us, than ourselves and that is what Iweartoghu is all about. I definitely can’t tell what exactly the future holds but based on the feedback I’ve received; I will say people are excited and proud to see our culture being represented on a social media platform in this manner. It amazes me to see the willingness of followers to contribute to the content as well as the follower count growing every day.